No one is sweeter than Mom. So while you’re waiting for her fresh Mother’s Day flowers to arrive in the mail, get creative and make her a truly original arrangement entirely out of sugary treats! This gorgeous DIY candy bouquet for mom only takes a few minutes to put together (no baking required! ), and it’s a Mother’s Day craft that no chocolate-loving mama could resist. Here’s a step-by-step tutorial on how to make one for your mom … because she deserves the very best! 1. Cut a piece of Styrofoam so that it fits snugly into your vase. Place the Styrofoam block at the base of the vase. 2. Fill the vase with crinkled filler paper in the color of your choice. Make sure to completely cover the top and sides of the Styrofoam so that the white color doesn’t peek through. 3. Pierce different-sized lollipop sticks into the Styrofoam in the spots where you’d like your candy flowers to be arranged. Using both small and large lollipop sticks will give your arrangement height and dimension. 4. Stick one green candy-striped straw into the base of each brownie bloom and chocolate-covered strawberry. 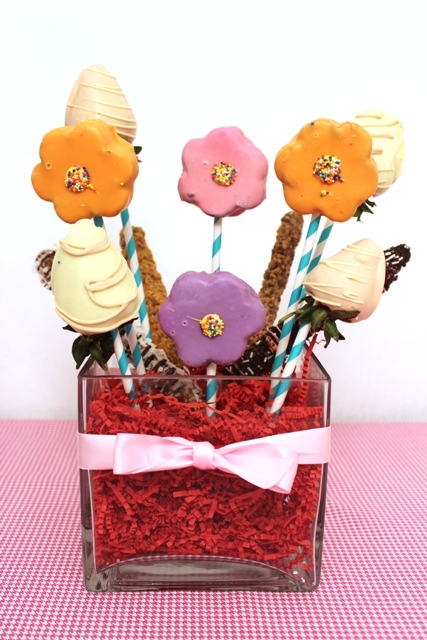 Then, take the skewered brownies and strawberries and start arranging them in the vase by placing them on top of the lollipop sticks, just like a cover. (The lollipop stick should go into the hole at the bottom of the straw.) This will securely anchor the treats to the Styrofoam and hold them up straight. 5. Take a few candy bar pretzels and stick them straight into the filler paper to fill up any empty spots in the vase. 6. Tie a ribbon of your choice around the vase to add an extra touch of personality to your sugary bouquet! If you’re not really the DIY type, don’t worry; you can still show your mom how sweet she is! Send her a delicious, ready made Mother’s Day fruit bouquet instead. They’re overflowing with Mom’s favorite fruit, all topped with the finest chocolate! So, crafters: What other kinds of Mother’s Day treats will you use to make your DIY candy bouquet?